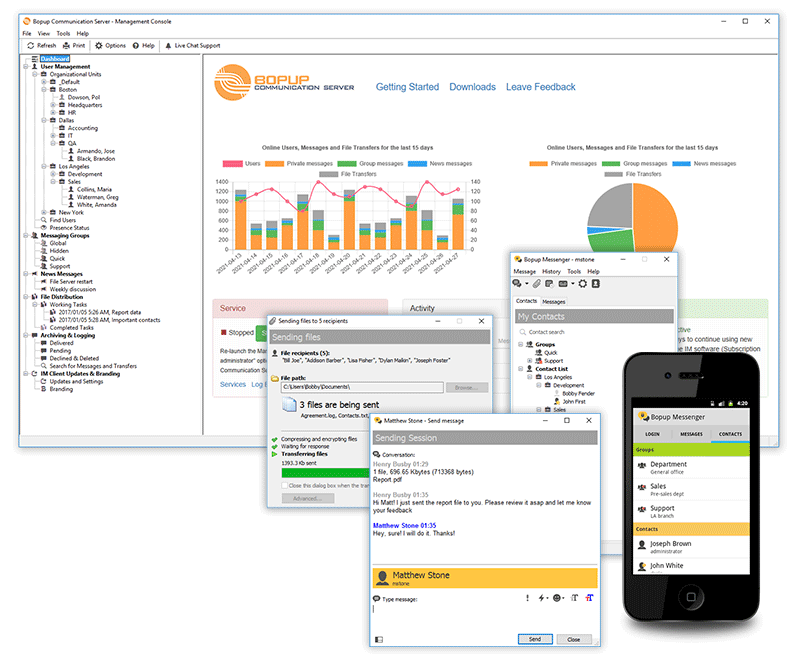 Bopup IM Suite Standard Pack is a secure client/server instant messaging system designed to provide efficient, internal and private communication over networks of any size. It meets most of the critical business and enterprise needs, such as centralized management, the Active Directory (LDAP) support, message and file transfer logging and can be easily deployed over the business infrastructure to unite the entire company's offices and other locations into one internal IM workspace with control over messaging groups, user permissions to view others and send messages and documents, message and transfer archives with printing support. This software bundle includes a license for Bopup Communication Server (IM server) + 25 instant messengers. IM clients for both Windows PC and Android platforms are supported.